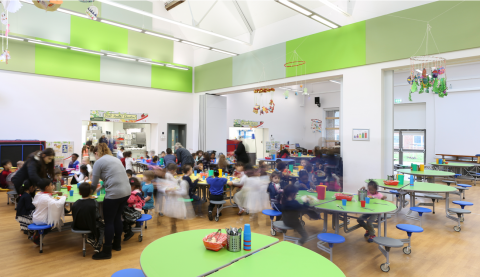 AD Architects designed new Kitchen and Dining Hall facilities to improve healthy meals provision at Brimsdown Primary School. 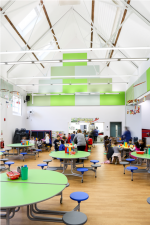 This involved the construction of a new dining hall and the major refurbishment of existing buildings to create new kitchen facilities. The improvement of existing buildings extended to the refurbishment of two outdated toilet blocks to create age and gender segregated facilities. The new kitchen and dining facilities replaced the school’s existing outdated 1940s Horsa huts which were demolished, providing the opportunity to reconfigure the external areas to create new car parking spaces. Further landscaping works were undertaken to enhance the main school entrance as well as internal courtyards, to promote outdoor learning and play. This project was delivered in two phases and was a pilot project funded by the ESFA’s Priority Schools Building Programme 2 (PSBP2).